My fiance loves Mexican food, so I wanted to make him enchiladas. In America I always relied on canned enchilada sauce, as well as canned chipotles in adobo. But here in Stockholm, it has been difficult to find those special ingredients. Thus I ventured to make my own. I found dried chipotle chilies at the supermarket -- it only says "dried chilies" but they look like chipotles. The bag always comes with a few small chilies and one big chili. I wonder if the big one is also chipotle? Anyway though this is a process, it makes a big batch that can be kept in the freezer for months. 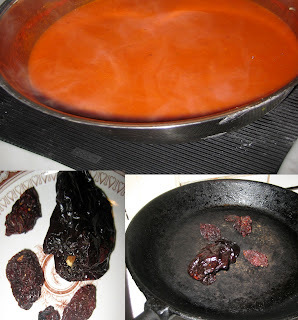 I use this hot, tangy and tasty sauce to dot quesadillas, burritos, huevos rancheros and of course to plunge tortillas in for enchiladas. I use it like a hot sauce as well, because it is very spicy. 1. In a pan on medium heat, toast the peppers until slightly blistered. Then de-seed them. Add them to a bowl with 2 cups boiling water. Allow to sit for 20 - 30 minutes or until softened. 2. Meanwhile in a saucepan, heat canola oil on medium low heat and saute the onions. Once softened, add the garlic and cumin and cook for a minute. Add tomatoes and simmer for 10 minutes, until the tomatoes start to disintegrate. 3. Puree the peppers with about 1/2 cup regular water. You may use the water the peppers have been soaking in if you don't mind the heat. 4. 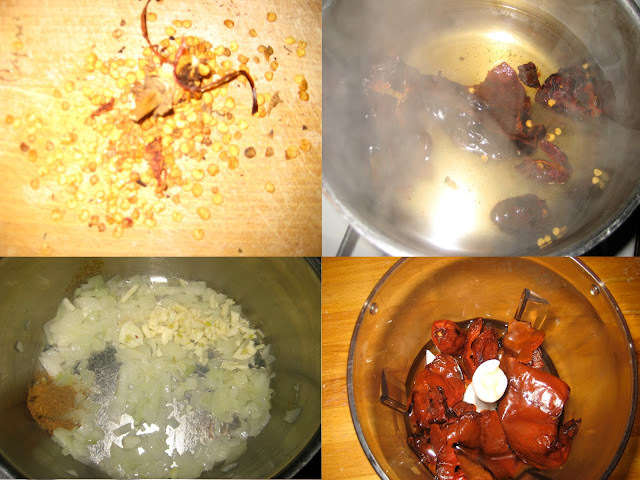 Add the pureed peppers to the tomatoes along with the 1 1/2 cups water, vinegar, salt and sugar and cook for 10 minutes longer. Turn off heat and add lime juice. Taste for seasoning, if it is too spicy, use extra sugar and vinegar to balance it out. 5. Puree everything to a smooth consistency. Use to make enchiladas and freeze the rest.